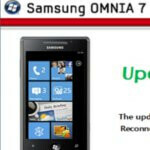 Not too long ago, there was an update made available to the Samsung Omnia 7 that aimed to install a security build and fix fraudulent SSL certificates. However, things didn’t appear to go as smoothly as planned for some owners of the handset since it apparently failed to install. Luckily, Samsung has corrected the issue for those affected handsets and is now making available a new software patch for them to download and install. Essentially, it now enables owners to fully upgrade to build 7392 with no problems, but it’s specially targeting handsets that receive the 801812C1 error. Still, it’s not recommended for everyone to install the update since it’s geared primarily to those who attempted to update the handset in the first place, but failed. In any event, it’s nice to see that it didn’t take too long for them to iron out the kinks with this one, but it would be nice to anticipate these kinds of things prior to pushing out any update in the first place.